In order to obtain improved product consistency, high yields and reduced process downtime, manufacturers and users of hygroscopic products and moisture sensitive materials recognize the importance of accurate humidity control. Traditional HVAC systems are not designed to deliver consistent dewpoint control below a 50ºF dewpoint, thereby necessitating that a packaged dehumidification system be provided. The Harris D/H Series Custom Dehumidification Systems are designed to meet your needs for dewpoint and temperature control, within the space limitations and budget constraints of each project. Lower operating costs than field built up systems. Close tolerance humidity control with systems maintaining tolerances as tight as ±0.5 gr./lb of dry air. Improved product consistency and higher yields increase profitability for pharmaceutical, lithium battery and chemical processing applications. System designs to deliver air as dry as a –76ºF dewpoint. Pre-piped and pre-wired system. Simplify field installations and reduce coordination headaches. The Harris “Single Source Quality Guarantee” provides the most comprehensive warranty available. Our capabilities can be expanded to include turnkey installation of ductwork, controls, electrical power wiring and full dry rooms where required. Very few humidity problems can be solved by simply buying a dehumidifier and ducting it into an existing room. For optimal humidity and temperature control, a packaged, custom built dehumidification system complete with cooling, filtration, face and bypass control at the dehumidifier and integration of controls is necessary. Is affordable and within reach of clients’ budgets. Required temperature and humidity control levels. Internal moisture load from personnel and product in the controlled space. Room exhaust and make up air requirements. Room infiltration loads from door openings, conveyers and wall joints. Space and services available for D/H Series systems. Personnel loads, product load and make up air requirements are usually the critical design factors which dictate the size of the dehumidification system required to meet your specification. 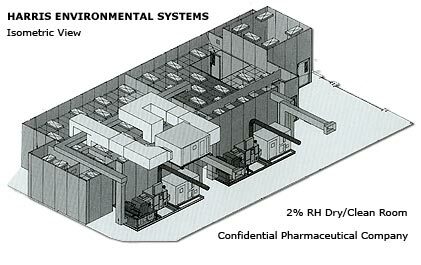 Our experience in dry room system design and construction has enabled us to redefine the actual moisture load generated from people in light assembly applications rather than accept outdated industry standards. Once we define the room temperature setpoint, quantity of people, and type of work to be completed, we can quickly calculate the expected moisture load from personnel in the controlled space. Defining moisture loads from products can be difficult since the moisture load is a function of the quantity of product and the differential between the entering product moisture content and the desired final product moisture content. Additionally, evaporation loads from wet processes must be calculated. Process exhaust is critical to the design of each system. Sufficient make up air to provide room pressurization and allow process exhaust must be included. Additionally, many of our D/H Series systems utilize a purge desiccant dehumidifier for reactivation air to reduce energy consumption and provide the lowest possible dewpoints. When utilizing dry air for reactivation, this increases the system make up air requirement. Each D/H Series system is designed with a preconditioning plenum module, the dehumidification unit, and final conditioning plenum module. All plenum housings utilize our double wall aluminum panels with a 2” isocyanurate foam core to provide vapor tight construction. The D/H Series double wall plenum design provides superior insulation (R-16) when compared to fiberglass or Armaflex insulation without the hardening and adhesion problems encountered when these materials are applied to sheet metal plenums. 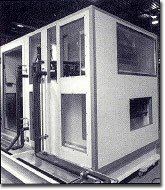 Our double wall design also meets FDA GMP standards for air handlers used to in clean rooms or validated facilities. The desiccant dehumidifier is selected based on moisture removal requirements and only dry desiccant units using HPX, lithium chloride, silica gel or molecular sieve desiccant are used. Dehumidifiers can be reactivated with electric, steam or natural gas and range in capacity from 150 CFM to 15,000 CFM. For ultra dry applications, rotating desiccant wheel dehumidifiers shall be utilized because of their ability to achieve a delivered air condition of .047 gr/lb or dry air (-76ºF dewpoint) while utilizing less reactivation energy than other desiccant systems. A welded aluminum discharge duct from the desiccant dehumidifier connects to the final conditioning plenum module. Components with this module include fans, cooling coils, filters (including HEPA filters), heating coils, steam humidification, and heat reclaim coils. Fig. 1 illustrates a typical D/H Series system. Where floor or roof space is available, the D/H Series system will be built on a continuous skid to ease installation and system design. When space limitations preclude utilization of a horizontal air flow skidded system, Harris is well versed in designing vertical or U-shaped D/H Series systems to fit within tight mechanical rooms. Each D/H Series system can be pre-piped at our factory to either direct expansion cooling coils or chilled water coils depending on your available services. Integration of cooling coils with air or water cooled condensing units can also be provided for each D/H Series system. As a leader in quality industrial refrigeration system designs, including cascade systems, two-stage systems and biomedical process cold rooms, Harris refrigeration systems provide a level of quality and system integration not available from other package system manufacturers. Although many air handler manufacturers can select coils, fans and filters, our background in process controls allows us to offer state-of-the-art industrial controls for temperature, humidity and pressure. Each D/H Series system will include a control panel, which can include any of the following components. PID microprocessor controls for temperature and humidity assure close tolerance control. Humidity sensors using either frosted mirror dewpoint sensors, aluminum oxide current inducing sensors, or thin film capacitance electronic sensors. Final sensor selection is based on humidity tolerances required. Complete DDC “smart controls” systems with touchscreen access for data monitoring, control and remote PC data acquisition. With a modem hookup, Harris can service each system from our factory. Setting of the D/H Series system in the proper location. Installing all refrigeration piping from a remote condensing unit to the system piping headers. Completion of remote sensor and control wiring for temperature and humidity to all controls provided. Installation of ductwork from the mechanical system to the conditioned space. Complete turnkey responsibility provides the owner with the assurance that the D/H Series system can be managed by Harris from system conception to final system start up. 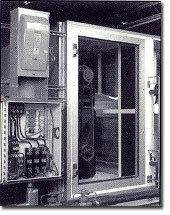 Harris Environmental Systems has been a turnkey manufacturer of environmental rooms for over forty years. We originally specialized in low temperature refrigeration systems and the installation and design of working cold rooms, incubators, and freezers utilized in hospitals and universities for medical research. Since the late 1960’s we have specialized in providing dry rooms and low humidity systems to meet the needs of manufacturers of moisture sensitive and hygroscopic products. Today, in addition to our cold rooms and incubators, we specialize in modular dry rooms, D/H Series custom dehumidification systems, clean rooms, cycling chambers , and archival storage vaults. The Environmental Room Division is complimented by our Refrigeration Service Division. Our highly skilled pipefitters, carpenters and electricians install, test, and start up all components to assure a quality installation. Installing a field built up dehumidification system forces the client to coordinate with a multitude of manufacturers and contractors. This requires hours of planning, coordinating and equipment expediting to achieve project completion. When a D/H Series is turnkey installed by Harris, we coordinate and control the design, manufacturing, start up and installation. We take the burden of working with several sources off your shoulders and onto ours and provide you with an additional benefit – that the D/H Series system and all mechanical components will meet your specs for humidity and temperature control for one full year after start up. The next step is yours! Humidity control is no joke when thousands of dollars of product are lost to seasonal fluctuations, low yields, and high maintenance and operating costs due to marginal system design. You can call your local “friendly contractor” who will attempt to build a dehumidification system and hope that the result will meet your needs. Or, you can call the experts at Harris Environmental Systems, who will design, build and guarantee that your D/H Series system will maintain precise humidity and temperature requirements critical to your application. If you can’t take the chance on mediocre design, callus for a free consultation and proposal.